Our Dutch barge idea was formed in 2001and the Klipper was hoped to be completed by the summer of 2007. Unfortunately, if hasn't! - Follow our below diary of the ups and downs. Summer~01 Jennie & Alan saw a 'smallish' Dutch Barge pass their house as it traversed the Grand Union Canal and they made enquiries of the skipper... "Err, what is it?" Summer~01 Found out about the DBA, went to their last day of a 4-day DBA barge rally in Chatham then joined the association (Dutch Barge Association). Autumn~01 Since this date, we had regaled all our friends with this barge goal of ours and, they thought we had lost life's-plot! Spring~02 Went to France and did a T&D Murrell 4 day CEVNI barge navigation course to confirm if we liked European barge life... or not! Got RYA CEVNI license and loved our brief barge experience. Throughout~02 Visited many UK based barge builders and learnt all the bull-sh1t imaginable, realised they couldn't build what we wanted. Summer~02 Went to Ghent for 5 days and became barge groupies @ DBA 10 year barge celebration rally - gained loads of input and made new long-term friends. Autumn~02 Realised didn't know enough about boat design/building so joined Greenwich Maritime Museum library and Alan became a swot. Late~02 Alan joined an aluminium boat builder in Wales as marketing specialist with ultimate view of them building JENAL - company proved incompetent and eventually went bankrupt in '04. Throughout~03 Went to many DBA events & boat shows for much more marine input. Late~03 Joined another Boat builder as marketing specialist with ultimate aim of them building JENAL - sadly, they took us for a ride, but not on the water! Throughout~04 Collected & purchased period maritime barge bits & pieces from boat-boot-sales & eBay. Spring~04 Did RYA day skipper course and got license. Summer~04 Found via a friend, we found a hull designer in Holland and visited them to explore their capabilities. Summer~04 Did RYA VHF radio course and got licence. Late~04 (Unfortunately) paid & placed a design order with the recommendation company ultimate aiming for them and their partners to build JENAL for us. Autumn~04 Alan joined a year long interior design course to learn how to properly design JENAL's interior. Autumn~04 Jennie joined a year long French language course to learn how to speak it properly - we got a heavily accented Spanish teacher. Now... there's a new challenge for us! January~05 Built and launched this JENAL website. February ~ 05 Purchased a CAD programme and attempted to master it as a method of improving JENAL's full design and communicating it with all commercial partners. March~05 Attending DBA workshop on barge living in Europe by DBA members who do just that... live the retired or home-afloat bargee life. May ~ 05 Explored possibility of having interior cabinetry made in China and shipped to UK for completion. The reasoning for this; beautiful period woods, quality, appearance and cost. June~05 Attended a 5 day DBA barge rally in Namur - Belgium for more research before the start of the Klipper build, proper... Wow! July~05 The start of the building design of JENAL. Production of the CAD drawings to eventually cut & profiled steel plates, ready for fabrication. Also added some new ideas to the JENAL design. 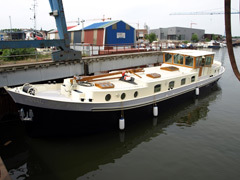 Decided to have JENAL built to SI certification so that she is certified for ultimate barge usage including the Rhine. September~05 Continue to chase key suppliers who just don't seem to energise themselves and phone back. It is crazy because it is valuable business but this seems to be the way of 'business' these days... barmy! October~05 Finalised contract which took months - Jennie gets the contractual detail just right. This proved ultimately very, very important! November~05 Already there is further delays in building JENAL due builders having urgent work. The 20mm base plates and 10mm chines are just being laid now... hey ho! January~06 Visited Ament, disappointed that JENAL had progress very little due to longer completion time of 'Aslaug' a 24 meter Luxemotor owned by the Arnild's. It was a blessing in disguise because the bow locker size was wrong, it was too small (plans not followed correctly). This we have been able to rectify fairly easily. Ament have promised 3 men, full-time, on JENAL which will catch up on some lost construction time. February~06 Still amazed at how many suppliers let one down - obviously they have earned far too much money ;-) Added complication has arisen, do we opt for 2 big engine alternators for cruise charging or opt for a hydraulically driven generator and drop having a separate QP diesel geny... decisions, decisions!! 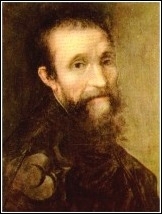 Some Barge Building Perspective from an Artistic Genius: "It cost Michelangelo 4 years of his life to create the wonderful Sistine Chapel ceiling painting. The first section he completed was (ironically) the illustration of Noah and the flood... It didn’t read well from the floor below. He had forgotten that the viewer would be trying to decipher the image from a distance of thirty feet; as he progressed his characters became more heavily emphasised and much more visible." We wonder what 'perspective' he would have made of building JENAL, similar we believe... just as J&A have! March~06 Visit Netherlands to apply extra detail to JENAL's build and interior layout because it is much easier to visualise interior wall locations and exact staircase positions when you see the vessel 'in-the-flesh'. One of the many complications will be the aft cabin window shape. We want a traditional design (curved top straight sides and bottom) which have to fit in with the various angles of the superstructure in this complex shaped area. Also good opportunity to take photos of this build stage. The multi curved Klipper bow has proven to be more difficult as paper design and real-steel are quite different to construct from a single sheet of steel. Now it will be made from several sheets to maintain the compound curves and beauty of her lines. April~06 Lots of construction information input required at this stage plus some diplomacy to get each supplier to work in harmony with the other. This is due in part, to the technical complexity of JENAL. Late April sees us in Gorinchem (Netherlands) for a 4 day DBA barge rally. More barge input ideas and a chance to see the Arnild's new 24 meter Luxemotor, fantastic! May~06 The big disappointment time, delayed build. Due to engine supply delays JENAL is likely to be finished to its sail-away stage by earliest, October 06. Chance to improve detail design such as size and position of skylights and select special heat reflective glass throughout JENAL. July~06 Progressing slowly until now. With delivery of the DuoDrive prop installation system and other badly needed construction items, the flow of build should accelerate. The factory closes for 3 weeks during late July and early August so progress will be stilted but a promise of JENAL to be in the paint shop by end August gives us extra hope. It will more than likely be end September before paint starts appearing! August~06 For the fist time in our travels to the ship builders in Belgium we are forsaking our trusty A2 in favour of a hired Transit van because we want to transport the BMW bike and other components we have collected. We spend several days trial fitting the bike and RIB in the hold (bow locker) of JENAL to make sure all fits in and all are secured well. October~06 Visited Ament to view JENAL for the final time before going into the paint-shop to make sure there was no items left to attach with welding (not wishing to bugger-up the finished paintwork). But the reality was, very little had been done to JENAL due to key Ament personnel being away, ill. Hugely disappointed but consoled ourselves because we were able to make minor improvements to here spec. as we progressed. November~06 Good to report that most of the fabrication work has been completed and she is looking very good. Lots of neat detail built into the fabrication which makes both JENAL and Ament (the barge builders) really shine! Met Eddy Paal of INPALA we have commissioned to build some of the interior woodwork; all the wheelhouse teak work, the interior paneling and the wooded room bulkheads and doors. Eddy is also designing and building the 2 double beds, the aft cabin one being a particular 'challenge'. These will give us somewhere to sleep during her first sea trials before retuning to the UK for Andrew Varah's excellent cabinet making. January~07 Over the Christmas period, 'JENAL' sails into the paint shop and starts to look like one entity as she gets her inside and outside coat of rust primer. February~07 The installation of the mechanical items progresses, engine room insulated and it is starts to resemble a Klipper. Room for a few minor amendments by 'A' as she is built up. March~07 Mechanical work is halted as painting of JENAL reaches its final stage. Hydrosta (Dutch hydraulics suppliers) hit 'J&A' with another bill because they had not originally planned for the harmonising of the electronic controls to run both engines and hydraulic drive system - ouch!! April~07 Work carries on and paneling out commenced at Aments works, although we thought JENAL was to be moved to the Dutch carpenters factory. Hey ho!! May~07 What a disappointment! Work had not progressed as we were assured with each of the parties blaming each other plus other ship builds coming in-between our construction. We trust the builder will be as good as his word and pull it all together for a quick completion Thank goodness for Eddy Paul (Dutch Carpenter) who is paneling-out with speed and excellent thoughout. Time for another 'sort-out' and reality check! June~07 Alan spent 4 days working with the Ament team plus Eddy the carpenter and Frits the electrician to resolve a mass of small details to really progress JENAL. The result, to-date, had been beneficial and the build moved up a gear. July~07 J&A visit the Ament factory to progress the build of JENAL prior to then driving down to France's Bergerac area to meet up with fellow bargees in celebration of Phil & Phyl's (Zingara) 40th wedding anniversary. Ament close for three weeks annual holiday so this visit will be the last for 6 weeks or so and add a further delay burden to completion of JENAL. August~07 Two factory visits this month, one quick one by bike to guide Ament onto JENAL after their closure and the second with Tim Smith of Andrew Varah UK cabinet makers to finalise the kitchen and aft bedroom dimensions to enable the cabinet makers to complete their UK based work. The trip was planned to coincide with the installation of the fibre optic lighting circuits by UFO. With Tim's input, we made some detailed changes to the lighting layout and woodworking designs, all for the better. September (late)~07 This factory visit proved a milestone because a launch date had been allocated for mid October. J&A have not crossed their fingers but it looks promising. The main item left to complete is the painting of the wheelhouse which includes the hand painting of the external wood effect. The other landmark for this month was the final hooking up of the two engines and their first start-up. Progress indeed! October~07 The launching of JENAL is planned for this month! November~07 Surprise, surprise, she is still not launched and unlikely to be so until sometime in the future. Partly because Hydrosta have continually given no or incorrect installation schematics for the complex hydraulics installation they designed and supplied for JENAL, sending both Ament and Frits (electrician) into complete confusion. Hydrosta are a supplier, not to be recommended. November~12 JENAL, is returning to Ament Metaalbewerking where she will cleaned up from her long time of near neglect and undertake 3 months of completion to basic contract level. She will then transfer to Maasbracht where she will be sea-trialed. Finally, Maasbracht based Eddy Paal of Inpala Interieurbouw will finish his carpentry work. March~13 JENAL is on hard-standing at Ament Metaalbewerking and the disgusting 12/13 winter and spring weather is hampering her completion. Inside work on JENAL is less weather dependent and the 2 wet-room bathrooms are nearing completion with being fully wet-proofed, tiled and plumbed to be fully operative. Frits Schrauwen, who did the sterling work of wiring up the DC (all the operating systems) electrics is now tackling the AC side. Coping with J&A's stylized choice of electrical switches and lighting desires. July~13 Transferred from Ament to Maasbracht waters, JENAL's 75 tonnes was lofted off the technically clever low-loader and launched onto Maasbracht waters. Enabling the main artisans, including Eddie Paal (carpentry) and Ament (slow as was becoming the increasing case) to complete their work. It took several month longer than was advised... "nothing new there then!!" June~14 JENAL sailed to Hydrosta to resolve some hydraulic issues and re-engineer some Ament build mistakes. Then she was finally underway. ... unfortunately, Jenal's workers didn't inhabit the ideal world so no one knew the plan!